In this article series we have already covered aspects to consider when selecting campsites and safe practices after an animal is down in grizzly country, but what about personal protection in these wild places? Any search online for “bear spray vs. handguns” will surely land you in a battlefield of written words, empty threats and will likely leave you more confused than when you started. 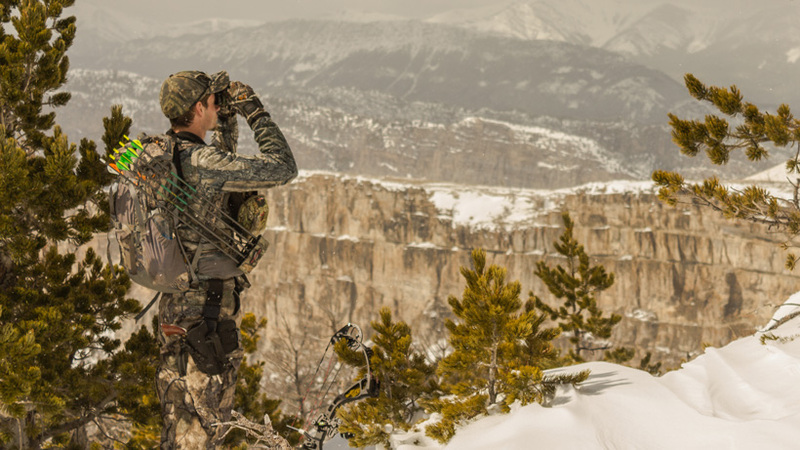 In the following article, we will discuss the sciences behind each method, cover historical statistics and, hopefully, break down the unknown barriers when it comes to self-protection in the backcountry. When going into your favorite sporting goods store you will generally find two options for self-defense sprays: bear spray and pepper spray. While both contain the same product there are some differences that make each individual product better for what they are intended for. Pepper spray generally contains a 10% concentration of oleoresin capsicum—the chemical that gives chili peppers their heat—while bear spray generally contains a 1-2% concentration of the same chemical. Why the difference? In the case of pepper spray, the product is intended to completely incapacitate a possible human attacker and effectively render them powerless. In the case of bear spray, the product is intended to dissuade the bear from further approaching and to get them to leave the area immediately. The lower dosage will not only temporarily sting the bear, but also give them the opportunity to retreat. Pepper spray will most commonly shoot a stream of spray up to 10’ while bear spray will shoot a cloud of spray for a distance of 30’. The extra range advantage has obvious benefits and the cloud emitted from the bear spray also makes area coverage accuracy much higher. When selecting a spray you will generally be presented with a few options that include bottle sizes, effective ranges, and total spray times. While the subject is highly debated, the generally accepted fact is that a shorter spray time will get more product into the air faster while a longer spray time may give hunters the chance to spray an aggressive bear multiple times if necessary. The one fact to remember here is that no two bears will charge or attack the same way. Some bears may run full tilt to cover the whole distance while others may bluff charge and stop a few feet short. 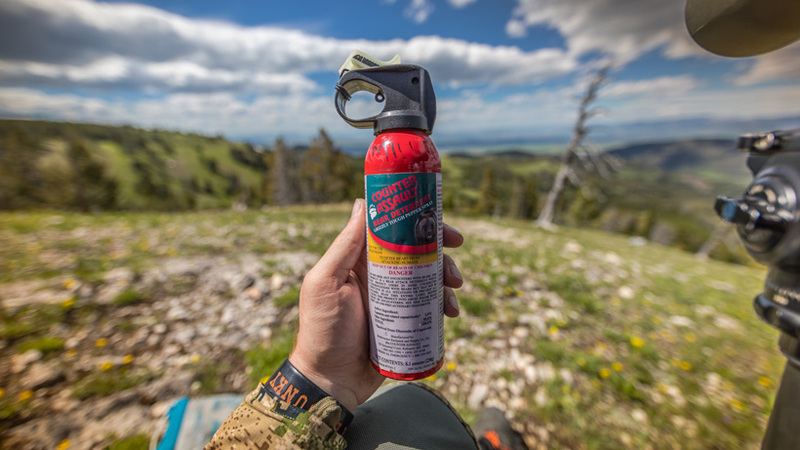 Emptying your bear spray completely may be a mistake if and when a bear stops momentarily; however, on the other hand, getting your entire can into the air immediately can be life-saving when a bear is hell bound on reaching you. Trust your gut and choose the spray that gives you the most confidence. One common mistake that most people will make when encountering bears in close quarters is dispatching their spray too early. Remember that most of these sprays have an effective range of 30’, which is equivalent to 10 yards. Even a small wind can blow most of your spray out of the bear’s approach route if deployed too early. Obviously, a wind from your back is best for the deployment of the spray, but not always a feasible option. A sometimes too unfortunate fact is that when the spray is used, the users themselves may end up with a dose as well. Like most instances, the encounter will happen much faster than anyone can comprehend and a clear train of thought will likely not exist. If a bear retreats after using your spray, try to exit the area slowly and deliberately while keeping your eye on the direction the bear left. 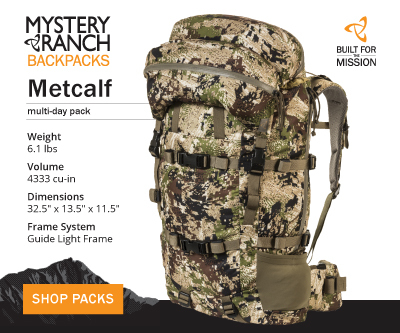 Mystery Ranch Bear Spray Holster. Refer to the manufacturer's instructions on deploying your spray. Some of the longer lasting cans will instruct users to spray a 1-second burst immediately and then to empty the can if the bear continues while some of the faster spraying companies will instruct users to completely empty the can with the first use. With the cloud or fog nature of bear spray the best method is to simply aim the can at the bear and spray; do not worry about any type of zig-zagging motion. Before entering the woods, play with different mounting options for your spray and practice unholstering and removing the safety cap. 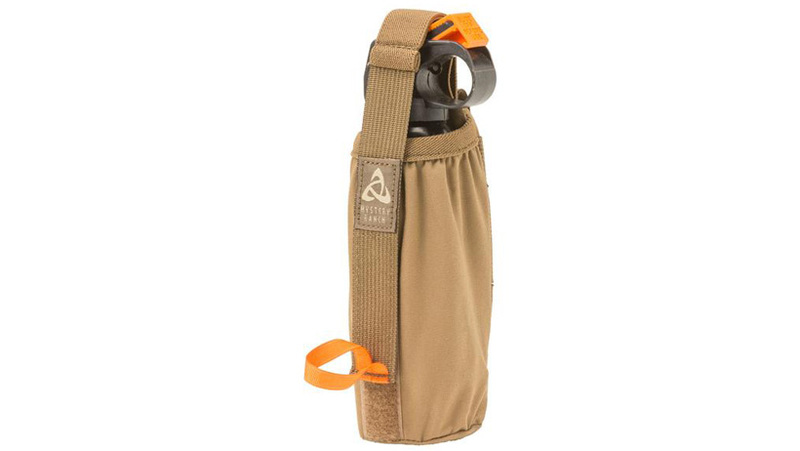 Additionally, some excellent aftermarket spray holsters can be purchased that can create a more stable connection to your belt or pack over the options that are included with the spray. When selecting a sidearm for bear country protection the options can become much wider and more diluted than those found in the bear spray market. The biggest decision most potential buyers will encounter will be choosing either a revolver or semi-automatic pistol. Generally speaking, more power can be built into a revolver frame though these options will usually be much heavier. 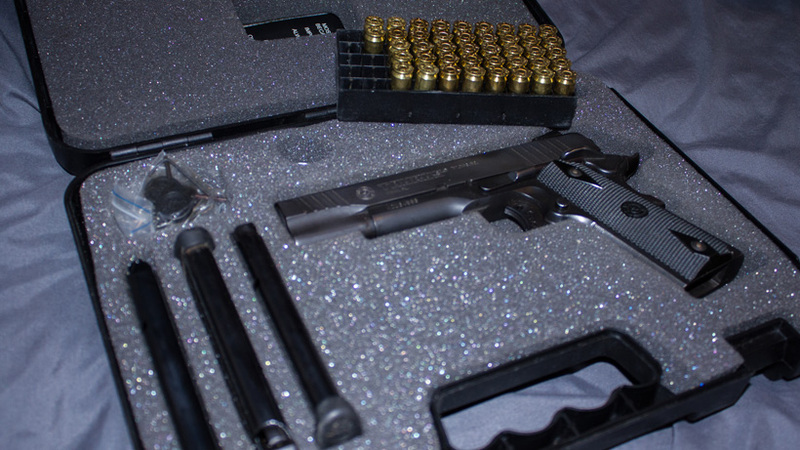 Semi-automatic pistols can be found for cheaper prices and will have a higher round capacity and tend to be lighter. Before jumping for the higher magazine capacity it is important to remember that grizzlies can reach a top speed of 40 mph. That's 50 yards in 3 seconds. The odds of even the most skilled marksman getting off more than two shots is slim at best. In the table below, we will break down the most popular revolver and pistol calibers shooting popular bear specific ammunition. Before moving on, I would like to add that the above table was generated with numbers from hot loaded +P rounds and that not all firearms are +P rated. Before using any purposely loaded bear rounds consult with the manufacturer of your firearm as serious injury could occur. When analyzing the above table it is interesting to note the obvious power advantage the 10mm auto has over the popular 45 ACP and 40 S&W. Additionally, it’s also worth noting that the 10mm auto comes in just under the 357 mag, which is the least powerful of the revolver cartridges. 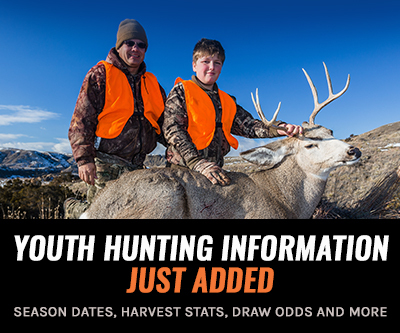 For most backcountry hunters weight is a major concern and a sidearm is generally going to add a few pounds or more. 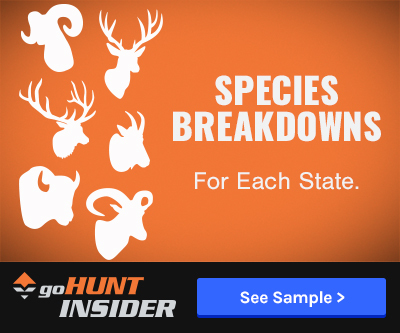 In the following table, we will break down some of the most popular options in the best bear defense calibers. Before continuing I felt it important to note that the above firearm models are ones that I have personally sold while working in outdoor retail for the last ten years. This is by no means a finite list nor should it be taken as such. These are merely the most popular models among my customers and firearms I personally trust in. Most of the models on the list have a barrel length of at least 4” and are +P rated. One of the biggest downfalls I see with most people when it comes to selecting a sidearm for bear protection is the user getting “over gunned.” What I mean by this is an individual believing that getting the most powerful handgun available is going to be the safest and most practical option. Simply put: if shooting a 44 mag or larger caliber causes you to flinch and slows down your target acquisition for a second shot then you are over gunned. While more stopping power is always great, an errant shot that misses the bear is not worth much when 400 lbs of fur, muscle, and teeth is heading your way. Consider seeking out friends that may have firearms you can test fire or placing phone calls to local sporting goods stores to see if they offer demo days. Three of most commonly cited bear attack studies, “Bear spray vs. Bullets”, “Efficacy of Bear Deterrent Spray in Alaska”, and “Efficacy of Firearms for Bear Deterrence in Alaska”, are often in the sights of critics, believers, and those on either side of the fence. In all three of the reports, the general theme is that the researchers are heavily biased towards the use of spray as opposed to firearms. The reports have been widely refuted by many sources citing that the researchers only took into account encounters with aggressive bears when firearms were used as opposed to encounters with nonaggressive bears when spray was used. These facts have never been proven or disproved. In the end, the reports show that bear encounters with firearms resulted in injury in approximately 50% of the cases while bear spray was 98% effective at preventing injury. Really, there is only one way to answer this question and that boils down to personal preference. Confidence in your equipment is going to be your biggest weapon when it comes to dealing with an unfavorable bear encounter. All too often I see customers purchase handguns and then never practice with them to become familiar with their functionality. When deciding on a firearm for the backcountry, users should be fully committed to learning how a weapon handles and fires and, then, ultimately, become proficient enough with the firearm that they feel they can adequately hit a moving bear. Conversely, I can’t count how many times I’ve seen people—both hikers and hunters—on the trail with bear spray strapped in a totally inaccessible location. As we’ve said before, bear encounters happen quickly and having a well-rehearsed plan of action can make a difference between life and death. If you’re someone who considers themselves effective with a handgun or is willing to learn the skill, then the lethal stopping power of a firearm is going to be an excellent choice. However, be honest with yourself. If you are not the type to hit the range regularly (which is totally fine! ), then maybe spray is a safer and more efficient option for you. @Gordon L- That two can system definitely sounds effective! Stay safe out there! Been in Griz country numerous hunting & flyfishing multi-day trips. I ALWAYS PRACTICE W EXPIRED CANNISTERS W BOTH HANDS BEFORE THE TRIP. AND CARRY TWO CANNISTERS ON MY PACK CHEST STRAPS SO THAT IF ONE HAD IS “OCCUPIED “ I start w the other and am grabbing #2 and ready to use it. I’ve had 4 encounters in NW Wyoming that were to close for comfort. If the bear can’t see or breathe due to pepper-induced bronchospasm and can’t see or smell also, you get some time to re-assess and Dr-escalate the situation. @Stephen S- Carrying both is definitely a sensible idea! Totally boils down to personal preference though and I do believe that some people may have issue with carrying both if they do not have a clear plan of "grab that one first!". Good luck this season and thanks for taking the time to check out the article! @Gil B- The issue's the gentlemen was experiencing cylinder lock was due to recoil, as you noted. Due to the lightweight design of the 329PD some heavy rounds may slip the crimp during recoil and the bullet itself will actually slide out the brass far enough to become exposed on the front of the cylinder. This obviously causes the cylinder to become immobile. There are several good bear loads that are double crimped and safe to use in the 329PD without issue. Thanks! Why would you not carry both. There are situations where one is more effective while there are situations where you would not want to use one... Bear grabs you while you are in your tent - bear spray will be useless... and that is an outright feeding attack - fight for your life. 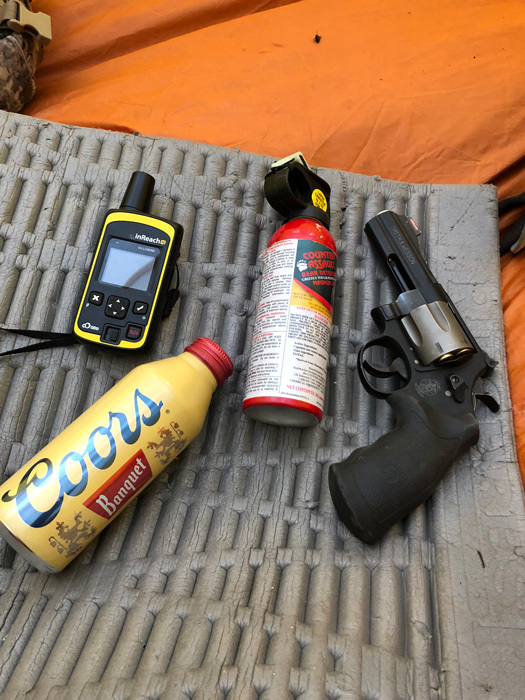 Bear spray would be first line of defense for an open charge or challenge as it should put up a boundary parameter to prevent physical contact. But what are you going to do for the second charge when you are out of spray. Carry both and leave something else at home if you are that weight sensitive. A well known and respected hunting personality purchased the S&W 329PD and noted to me that the cylinder would lock occasionally--apparently the recoil was the culprit. His advice to me was to avoid the model and purchase another.